After 40 years of active practice, I still enjoy working with and helping clients and other lawyers on interesting and complex matters within the areas of my expertise. Jim Blain has concentrated his practice on maritime law since March of 1979 and has represented vessel owners and other maritime interests, including insurers, in personal injury litigation defense, collision and allision claims and defense, charter party drafting and litigation, U. S. Coast Guard, customs, immigration and other regulatory matters, and in insurance coverage litigation. He has substantial experience in defending personal injury and death cases brought under the Jones Act and the Longshore and Harbor Workers Compensation Act, and in defending and prosecuting cargo contamination and damage claims. He has also been involved in general insurance defense practice, including coverage litigation and defense of toxic tort and product liability claims. 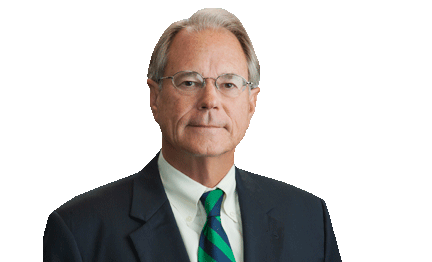 Jim's practice involves litigation, mediation, arbitration, trials and appeals, principally in federal court. Jim has also been an adjunct instructor at the University of Houston Law Center teaching legal research and writing and coaching moot court teams. Defended a vessel owner in multiple suits arising from a collision offshore Texas involving 30 fatalities, numerous personal injuries, pollution, vessel and cargo damage, Allseas Maritime, S.A. v. M/V Mimosa, et al., 812 F.2d 243 (5th Cir 1987), rehearing denied, 820 F.2d 129 (5th Cir. 1987). Defended Underwriters at Lloyd's in connection with a "political risks" insurance policy involving expropriation of the assets of two U.S. oil companies operating in Bolivia. Defended Houston-based offshore drilling contractors in connection with offshore death and personal injury/Jones Act claims, Edgebele v. Texaco Overseas Petroleum Company, 1994 A.M.C. 943, 840 F.Supp. 448 (E.D. Tex. 1994). Obtained defense verdict in a bench trial in federal court in Galveston on a Longshore Act third-party claim against a maritime employer on a fatality claim resulting from a barge explosion and fire, In Re: Barge NMS 1465, Complaint and Petition of National Marine, Inc., 1993 A.M.C. 2975 (S.D. 1993). Obtained a jury verdict for a plaintiff in a Houston federal court civil rights trial. Obtained defense verdict in Houston federal court bench trial for vessel owner on claim by Longshoreman injured in fall from a gangway, Giacona v. Marubeni Oceano (Panama) Corp., 623 F.Supp. 1560 (S.D. Tex. 1985). Obtained a defense jury verdict in federal court in Houston on a general negligence, multi-party case, involving a plaintiff with severe closed head/neurological injuries. Obtained defense verdict for tug owners in Houston federal court bench trial on multiple plaintiff Jones Act claims for hearing losses alleged to have been caused by exposure to noise on tugs, Hicks v. Crowley Maritime Corporation, 1983 A.M.C. 699, 538 F. Supp. 285 (S.D. Tex. 1982), aff'd 707 F.2d 514, 1983 A.M.C. 2408 (5th Cir 1983). Defended, arbitrated, and won product defect claims against designer of railroad cars brought by local utility. Prosecuted a cargo damage claim against a Ukrainian vessel and its owner for damages to drilling equipment. Obtained a recovery for owners of a tanker for damages sustained in a collision with a tug and barge in the Houston Ship Channel. Obtained summary judgment based upon charter party terms for the defendant vessel owner in federal court on a catastrophic property damage claim which arose from a tow to the Gulf of Venezuela. Prepared and filed numerous First Preferred Ship Mortgages for commercial lender. Drafted sample purchase orders and a freight forwarding agreement for a manufacturer involved in shipping its products worldwide on a variety of vessels from locations in the United States and abroad. Obtained a recovery for chemical company on its dock damage claim against a foreign vessel owner. Defended and prosecuted for two parties a multi-party appeal to the Fifth Circuit concerning a complex dispute over a charter party and a hull and machinery insurance policy. Assisted a chemical company with prosecution of a cargo contamination claim against a barge company. Defended Houston company in numerous asbestosis suits in Corpus Christi, Texas. Defended tug boat company in multi-party limitation of liability proceeding in federal court in Houston arising from serious personal injury accident. Defended vessel owner in state court in Jefferson County, Texas in Jones Act claim alleging that cancer arose from benzene exposure. Defended cargo owner in New York arbitration in demurrage claims. Drafted a specialized heavy-lift voyage charter party based on a BIMCO form, and on the strength of the unique demurrage clause obtained a seven figure demurrage recovery for a tug boat company. Defended a barge owner in multi-party litigation in federal court involving multiple injuries and multiple deaths arising from an explosion and fire on a barge and was able not only to obtain a summary judgment in favor of the barge owner but also to recover defense costs from the insurers of another party. AV Preeminent® rated (the highest possible Martindale-Hubbell Peer Review Rating designation).